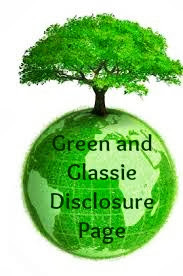 Green and Glassie: Have you heard of Keebler S'mores? Have you heard of Keebler S'mores? Hi….I wanted to make sure to tell you upfront that I have received no product or compensation to promote anything in this post. This post is about my life! If I use product names in this post it is because they are the products I used - no other reason. Thanks for visiting. I had a fantastic weekend. Isa, Davey, and I headed to our RV for our first camping weekend of 2014. This year in Wisconsin it has been exceptionally cooler than normal - this weekend was no difference. 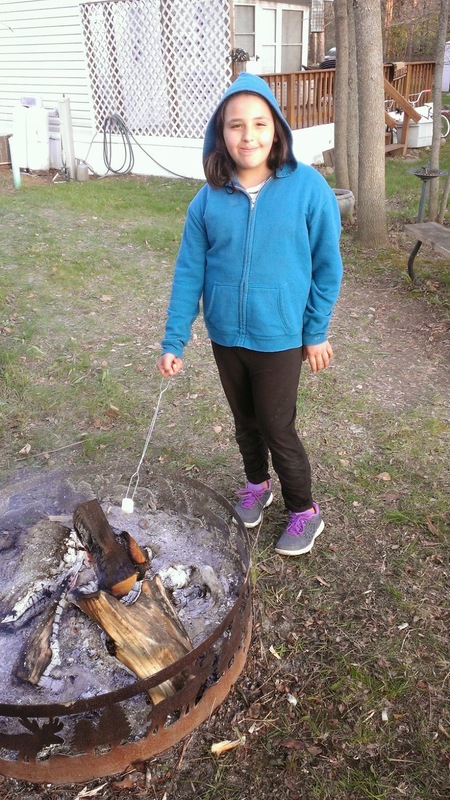 With temps averaging around 58 degrees it was a perfect weekend to get the campsite ready for summer fun. Amazing how many leaves can fall in the winter months - I raked and burned and raked and burned. I tried the yard blower but the leaves were just too wet - they needed to be raked. Spending my time between leaves and wood stacking it was a busy day on Saturday. 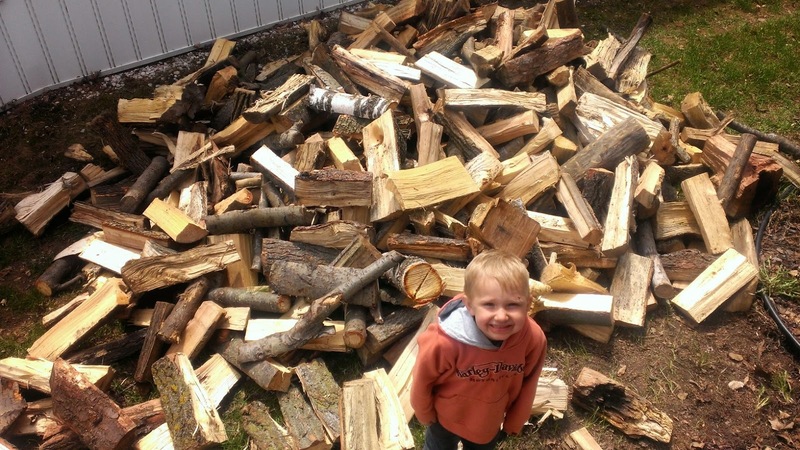 I had a truck load of firewood delivered. Yep...a truck load! 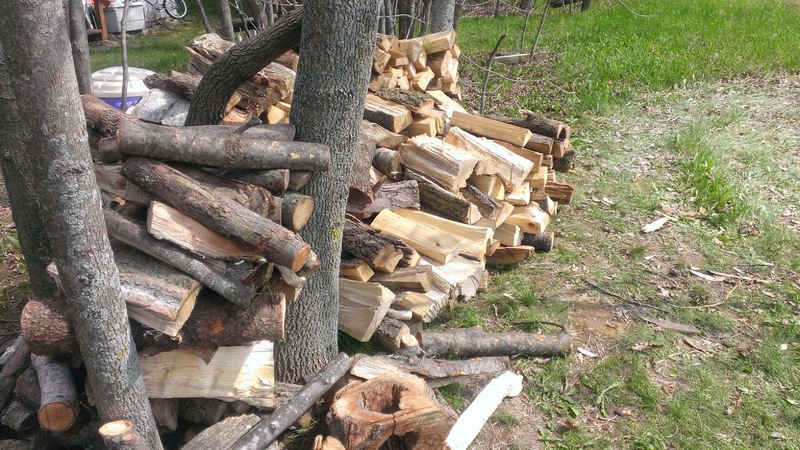 I must say it was quite a job for the three of us to stack all of the wood. I laughed and told the kids this is Nana's day at the gym. It took us a while but we got it! 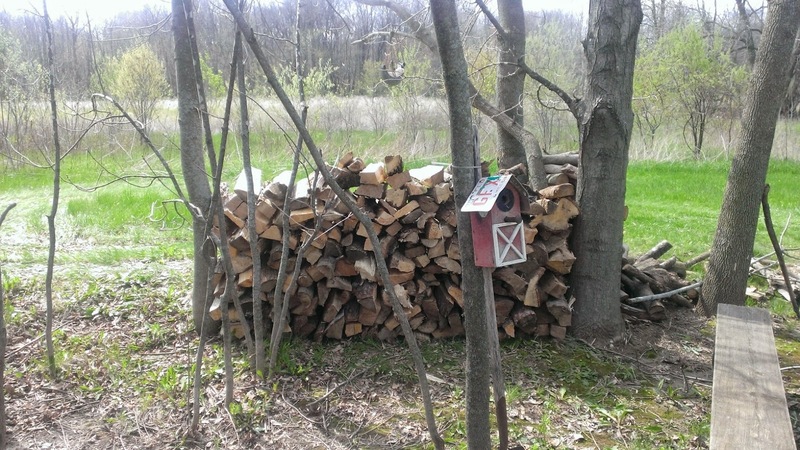 Nicely stacked not far from the fire ring. 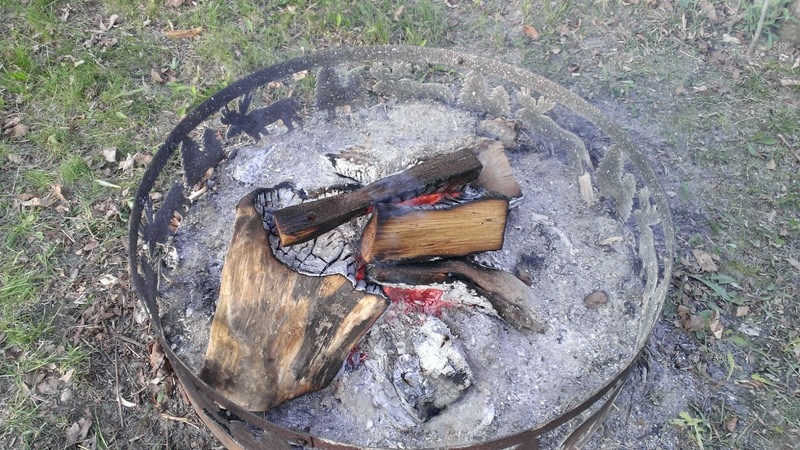 While we were stacking I was burning leaves and making us a fire to make our dessert. When we were finished stacking the fire was just right for making our new dessert. Oh My GOSH these are DELICIOUS! So easy to make and absolutely the tastiest S'more I have ever eaten. 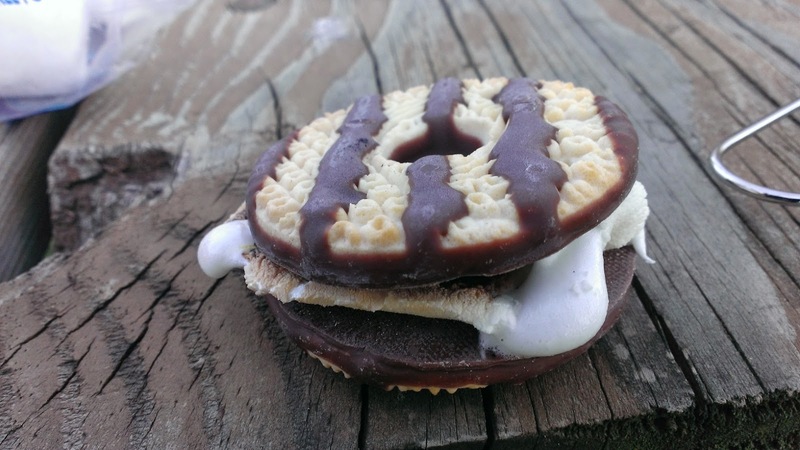 All you need are marshmallows, Keebler Chocolate Striped cookies, and a campfire. Toast your marshmallows and then place a toasted marshmallow in-between to Keebler Chocolate Striped cookies! DELICIOUS! When the sun started to go down so did the temps. After a long day of work and cool weather we were ready to call it a night. We headed into the RV for a hot shower and a little TV before hitting the sack. A perfect day! No I haven't heard of them, but now I want to go and make some! Yum! Sounds like a great camping trip! Those Keebler s'mores look really good! These look so yummy! My neighbors go camping every year I am so sharing this post with them! These look amazing! I love that it is a new spin on an old classic! No but they sure do look tasty!! Nom Nom! Those look amazing! We will have to give those one a go as soon as we move our fire pit. We usually just use graham crackers but those look much tastier! That is a step up in the S'mores world. These look so fun and delicious. I think I'll take all the ingredients to our cookout for Memorial Day weekend this Saturday. I bet they will be a big hit. I've never thought of making S'mores this way. Brilliant. We will have to try it soon. This is such a great way to make smore's! Especially since I'm not a big fan of plain graham crackers. Oh my gosh, the Keebler Fudge Stripes were my favorite as a kid! I'm going to try this! Thanks so much! the is genius! What a nice twist on the typical smores. Those look so good. Can't wait to try them this summer! I'll bet they're messy with all that melting chocolate, but those are one of my favorite all-time cookies. I'm gonna try it! Oh my goodness! I have not heard of these, but now I have to get some!!! Yummy! No, actually I'd never heard of these but wow! That looks like sweet goodness! There is a first time for everything! I bet these are better than the original! I have never heard of Keebler S'mores... but I can't wait to try them out this summer! Thanks for the summer idea. We should be having bonfire soon for this. Great advice! Thanks for adding to the discussion.Thanks for putting this together! It looks very cool so far. I’ll be checking back to see the full plans.always love the scenes from your weekend, but these are especially amazing.